For companies doing business involving delivery of products to customer’s address or location, a commercial or trade invoice always accompanies the goods to be shipped and delivered. Customs require companies to have commercial invoices sent along with the products for the easier identification of the products. Writer invoice in word examples can also be found in the site for your further reference. Just go to our home page and do a search for a specific examples you want. All examples shown in the site are available for download by clicking on the individual download link button below the sample of your choice. An invoice serves to monitor product sales while a receipt serves as evidence or documentation for the buyer for the amount that has been purchased of product. A receipt is confirmation of a payment while an invoice is a request for one. An invoice is issued before payment of a product while a receipt is issued in lieu of payment of a product. Total amount due is indicated in an invoice while total amount paid is on a receipt. Invoice examples in PDF are found in the site to better understand how an invoice is written and made. Just do a search at the homepage and click on the download link button under the sample to get a closer look at the file. What Is the Purpose of an Invoice and a Receipt? 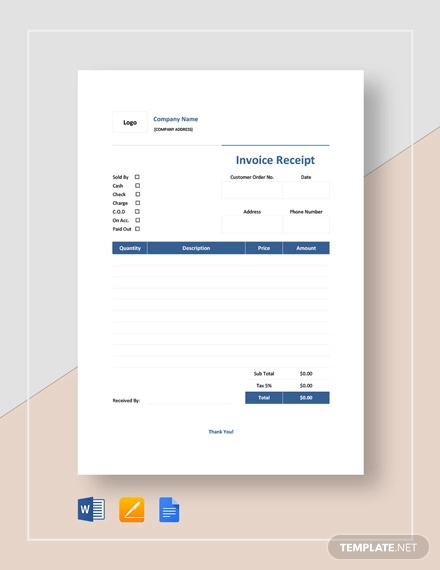 An invoice serves as a form of request for payment for a product or service while a receipt acts as proof of a payment of a product or service. Blank invoice examples are found in the site. Just click on any download link button below any sample you like to gain access to the file. Both the invoice and the receipt are an important part of the business process in a company. Both of them contain details regarding the buyer and also to that of the seller of the product. An invoice is used to request payment from customers. Issued payment invoices are also particularly useful in keeping track of the delivery and sales of product. This in turn, helps monitor and control product inventory levels or quantities. A receipt is used as a form of proof for the purchase of a product or service. Receipts invoice form the final documentation for a sale. It also helps track part payments for sellers offering payment schemes to their buyers. This helps the seller identify how much already has been received and how much a buyer still owes him. Invoices and receipts also help the business manage their taxes upon yearly tax submissions. By having a record of sales of a product, the business can properly compute their taxes in connection to revenue and purchases. Business invoice examples and simple invoice examples are found in other pages in the site. Please feel free to have a look around and search for an example you like.